Contemplated a decade and a half back, the present series of volumes on Sikh Gurus had their genesis in the need, poignantly felt by us, to reaffirm our commitment to the ideals enshrined in Gurbani and the composite culture of Panjab and to reach out to the people who are not fully conversant with Punjabi language and the legacy of the Gurus. As such, the present book on the life and poetical compositions of Guru Amar Das is not a dissertation tailored to a specific topic or frame of references; nor is it a routine biography detailing facts or events in soulless manner. We make no claim to learning or scholarship; nor do we pretend to have discovered anything absolutely original, hitherto unknown, from the labyrinths of records and manuals. An earnest attempt has, it may be submitted, been made to present rationally and historically the life and Bani of the Great Guru for the benefit of the readers exposed to cross-currents of cultures and thoughts. 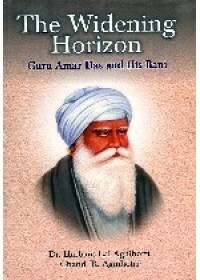 Though not the first to deal with the life of Guru Amar Das, the present volume is the first of its kind that covers the life and bani of Guru Amar Das. The bani has been rendered in transliteration for the benefit of readers, unacquainted with the Gurmukhi letters. The book traces the evolution, growth and expansion of the Sikh society under the stewardship of the Third Master. The Widening Horizon is a part if bigger project that modestly, though rationally, seek to transmit the universal message of the Gurus to the readers in the language and idiom they understand. We take the opportunity to acknowledge our indebtedness to the scholars whose learned treatises sharpened our insight. The kinship of shared perceptions is eternally gratifying. We would like to thank S. Kulbir Singh Suri (Nanak Singh Pustak Mala, Amritsar) and Shri S. N. Malik (Hisar) for their help and sustained interest in the work. Our thanks are due to Sarvshri Sandeep Kumar Agnihotri and Munish Agnihotri of Gopal Parkashan, Hisar. for their efforts to bring out the book impressively and expeditiously. Suggestions for further improvement of the book will be gratefully acknowledged. 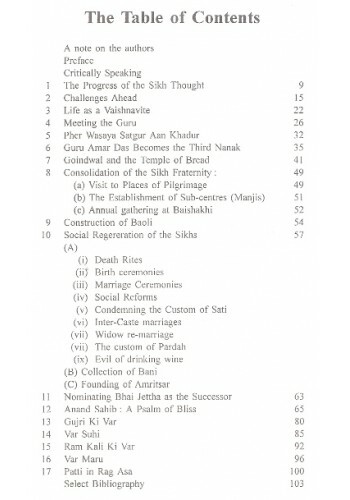 Preface Of The Book 'The Liberated Soul - The life and Bani of Guru Angad Dev' The com.. Preface Of The Book 'Creative Harmony - Life of Guru Ram Das Ji' By Dr. Harbans Lal Agnihotri ,.. Preface Of The Book 'Gathering Storm - Guru Har Rai Ji and His Times' By Dr. Harbans Lal Agnih.. Preface Of The Book 'The Life Divine - Life of Guru Harkishan Ji' By Dr. Harbans Lal Agnihot..
Frontcover of the Book 'Guru Nanak Dev - His Life and Bani' By Dr. Harbans Lal Agnihotri, Chand R. A.. 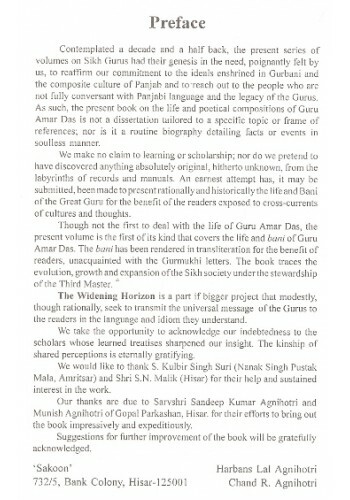 Preface Of The Book 'Guru Arjan Dev - The Poet Prophet' By Dr. Harbans Lal Agnihotri, Chand R. Agnih..
From the Frontcover of the Book 'Guru Teg Bahadur - Hind-di-Chadar' By Dr. Harbans Lal Agnihotri, Ch..
Introduction Of The Book ‘Guru Gobind Singh His Life And Bani’ By Dr Harbans Lal Agnihotri And Chand..
Introduction to the Book 'Happy Marriage - The Sikh Way' By Shamsher Singh Puri Durable, ba..